When parents buy their children that first pair of roller skates they usually do not expect that years later, the kids will be soaring through the air on roller blades, but extreme sports are popular with kids everywhere. Extreme sports or “adventure sports” include a number of activities, all of which take a basic sport or activity to a higher level and usually involve a certain degree of risk and danger. While onlookers may gasp at the perceived dangers involved with extreme sports, most extreme athletes feel that their sports are relatively safe compared to the pleasure that they get from participating. In fairness to these young (and sometimes, not so young!) athletes, most do take every possible precaution and are careful to guard themselves by utilising a variety of well-designed safety gear. Additionally, the skill needed to perform at an extreme level often takes many years to develop, so by the time that kids are actually airborne, they are very adept and knowledgeable about their sport. Their athletic ability and use of safety gear aren’t always enough to keep their Mums from covering their eyes as their kids perform, though, but in general, as long as kids are sensible about safety measures, most don’t suffer serious injuries. There are quite a few sports that are considered extreme, with skateboarding, rollerblading, and BMX biking being perhaps the most well known. In addition to those, extreme sports encompass some cold weather sports such as ice climbing, snowboarding, and downhill skiing. Warm weather fans may prefer surfing or even cliff diving (now Mum is really covering her eyes! ), but no matter the climate, if there is a kid with the need for an adrenaline rush, there is undoubtedly a sport designed to fulfill that need. 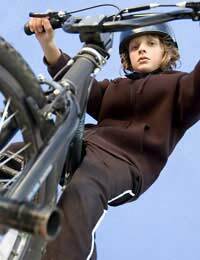 While some types of extreme sports are limited to families that live near mountains or a beach, kids who are into skateboarding, rollerblading, or BMX biking can often find places to practice no matter where they call home. With the growing popularity of these activities, many towns are now building skate parks and other designated areas for interested kids and their families. Excelling at extreme sports takes years of practice, and extreme athletes must start by learning the basics. In mastering basic skills, kids develop not only healthy bodies, but build confidence as well. Running, jumping, and climbing help to develop strength, coordination, and stamina, are important for overall health and fitness. Skating, biking, skiing, and surfing all help to improve balance, with even the youngest children able to participate when they have the guidance of involved parents. It’s important for parents to play actively with their kids, starting when they are young in order to foster an appreciation of physical exertion. While not all or even most kids who lace up a pair of roller skates will someday use their skates at the X Games, ascending towering ramps toward the clouds, all kids who are active and learn to love fitness will reap many health benefits – both in the short term and all throughout their lives. I wonder if you could help me as I have a child who is into extreme sports I would like some advice on where to start or where to go.